I grew up in the pre-MTV, pre-iPod era in Tokyo. I was a kid in the 1960s when I first heard Kyu Sakamoto’s “Sukiyaki” (Ue o Muite Arukoh). It knocked me out. It stands out as my first memory of music and had a lasting impact on my life. There were a couple of popular music shows on TV, and I searched for his performances and sang along. At that time, I never imagined that a couple decades later, I would be singing this song with my American wife in Los Angeles. She enjoyed listening to “Sukiyaki” in the Washington, D.C. area at the same time I did in Tokyo. My next memory of music was the Beatles, which my sister adored. Just to be different, I decided to stick with the Rolling Stones. This was in the mid-’60s, a little before component stereo equipment was introduced. I played the same songs over and over on a cheap record player, just as majority of kids in my generation did. Just listening wasn’t enough. I decided to start a band with my classmates and I continued to sing in a number of different bands through the years. After I graduated from college, I started to work for an ad agency in Tokyo. The agency had many audio equipment manufacturers as clients, including Pioneer, Yamaha and TDK. I was blown away by the vivid, realistic sound of the same songs I had frequently listened to. They sounded amazingly better on a great audio component system like the JBL 4343 speakers, McIntosh amplifier and Shure Type III cartridge. It was the middle of the ’70s and I was (very happily) dragged into the world of audio fidelity sound. In 2009, I joined a choral group for a concert of Beethoven’s 9th Symphony at Disney Concert Hall in Downtown Los Angeles. The goal was to cultivate friendship between different groups, and we did. The 9th Symphony’s “Ode to Joy” is a difficult song, and it took months for the group to learn. We all worked so hard for such a long time and developed such a bond that many of us began to think, “Why do we have to stop here?” Some members, including me, decided to form our own choral group, L.A. Daiku, right after the concert. It is such a privilege to be a singer and to be surrounded by the sound of all the instruments of the orchestra while you are on stage with them. What you usually hear is the sound of those instruments through some sort of a PA system. When you are on stage with the orchestra, you are able to hear them more intimately, as if you are in a small venue at a chamber orchestra concert or similar situation. Although I don’t consider myself one, I understand that an audiophile’s ultimate goal is to have the recorded experience of music as pure as if it is played live, whether in a recording studio or on a live stage. To really appreciate that, you have to know how those instruments really sound. So it’s enjoyable to be on the stage not just singing with the orchestra, but also able to listen to the live sound of the orchestra by being almost in the middle of it. Looking back on all those experiences, I realize that music is quite a big part of my life. It is a relationship that is definitely longer than any other in my life. .. even longer than the one with my wife! Music is my hobby; I simply gobble up the parts I like. I guess many people have a similar connection with music. The mono vinyl of the Beatles’ U.K. catalog was just released on Sept. 9. Although I enjoyed the sound of both stereo and mono versions on CD, the 2009 remastered stereo LP’s sound didn’t get a good reaction from fans and it took a long time to re-release the Beatles’ mono vinyl. This time, there was an effort to make it authentic, all analog, using the original ’60s process with tape recorders and even with engineers for mastering the mono! The reason? To get the ultimate sound of the Beatles, better than the first U.K. press. The outer sleeves of each of these mono albums will be precisely replicated from the U.K. originals. Even considering the master tapes’ aging, it’ll be a smart idea to go out and buy these copies. Ochazuke is a staff-written column. Opinions expressed in this column are not necessarily those of The Rafu Shimpo. 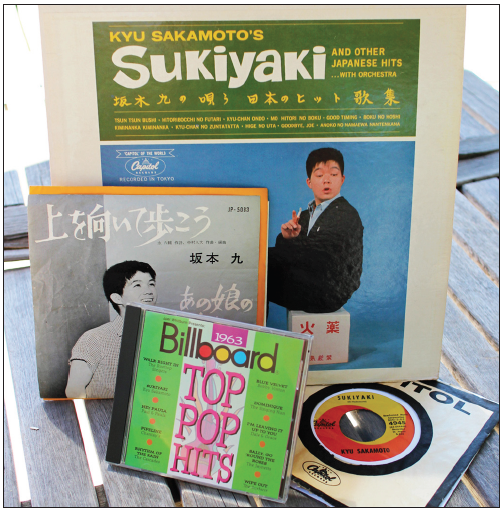 Kyu Sakamoto’s “Sukiyaki” U.S. LP and 7”, Japanese 7” and Billboard’s CD containing the song.